Yes! YOU can learn how to Make Biscotti. It is not difficult just different than making trays and trays of individual cookies. 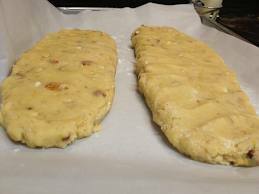 The best biscotti, starts with stiff sticky dough that is shaped into long logs or slabs and then baked on a cookie sheet. Once cooled, the logs are sliced on a diagonal and baked again. The longer they are baked, the harder they will become. 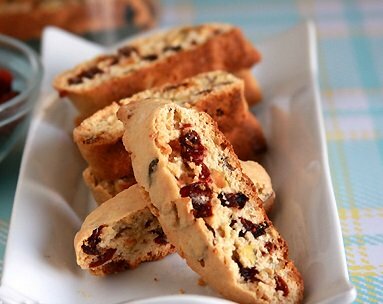 Making Biscotti is perfect for the busy home baker! Because Biscotti can be made and baked in stages. How to make biscott in three stages. On one day you can make the dough and store it in the refrigerator for a day or two. Then on the second or third day you can form the dough into logs and bake them. Then after storing the biscotti slabs at room temperature for up to a day you can slice them and baking them the second time. There is two basic ways of making biscotti. There are hundreds of recipes for making biscotti, but other than flavorings they fall into two distinct categories, those made with butter, margarine or shortening and those made without. The butter enhanced cookie, results in a more tender shortbread-like texture, and dough that is less crumbly and a bit easier to work with. The butter less ones, being somewhat drier, are best served with a cup of coffee, tea, or a glass of Port or Vin Santo in which to dip them. One quick dip and they melt in your mouth, with an added benefit of being low fat. 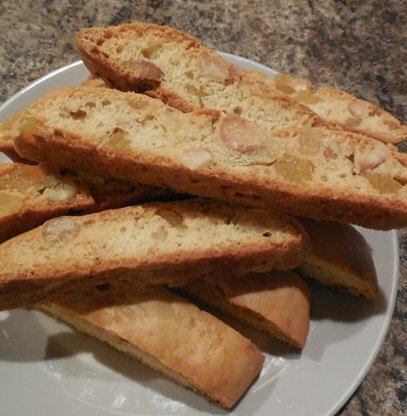 Biscotti are made from dense dough typically containing all-purpose flour, sugar, baking powder and/or baking soda, eggs, flavorings and add-ins, such as nuts, raisins, cornmeal, etc. Traditionally, when making biscotti,the dough is mixed by hand just as the Italians have done for centuries. But if you prefer it be can mixed with your KitchenAid Stand Mixer, the workhorse of many busy home bakers, just be careful to not over mix and warm the dough to much. Hand held mixers often don't have the power to mix the thick, sticky biscotti dough. After mixing, scrape the dough out onto a lightly floured work surface and BRIEFLY knead it just until it comes together, a count of 10 is usually enough. TIP: If the dough contains melted chocolate or other ingredients that make it sticky and hard to handle, simply refrigerate for at least an hour so it hardens more before kneading and shaping. TIP: Some recipes call for dividing the dough, when you do,I recommend using a kitchen scale to get equal portions, but then I am kind of picky. The dough is then PRESSED together with the palms of your hands. If butter less it will look like it barely sticks together, but don't attempt to add water or knead the dough again, you don’t want to over work the dough. Roll each portion under the palms of your hands into a cylinder a little shorter than your baking sheet. Place the logs of dough on an UNGREASED baking sheet lined with parchment paper or foil.Making sure the logs are not too close to each other to the sides of the pans; press down gently with the palm of your hand to flatten the logs. TIP: Another great option is to bake on a silicone baking sheet. Place the pans in the oven and start the first bake. Biscotti is typically baked on a shelf set in the middle of a 350 degree preheated oven. TIP: All ovens have hot spots, so it's best to rotate cookie sheets half-way through baking. Your cookies will bake more evenly. If using one cookie sheet, turn the pan front to back. If two cookie sheets in the oven at the same time, swap and turn the cookie sheets half way through baking. TIP: If you do bake two cookie sheets on one shelf, use small enough pans to have about 2 inches of space around each pan for heat flow. Biscotti logs usually bake for about 25 to 30 minutes (smaller ones bake faster), or until they are well risen and have also spread to about double their original size. The logs are done when pressed with fingertip they feel firm or dry to the touch and appear LIGHTLY browned. TIP: Do not over bake your biscotti as it continues to crisp as it cools. After baking, place the pan on a cooling rack and allow the biscotti logs to cool for ten to fifteen minutes before they are sliced into wafers, which are returned to the oven to crisp up. After cooling, place one of the cooled logs on a cutting board and cut it diagonally into slices 1/3 to 1/2 inches thick or whatever the recipe calls for. Use a sharp, serrated knife or an electric knife which works great. The thinner the cut the crispier the cookie, if cut thicker, they will remain somewhat soft in the middle, it’s your choice. The biscotti log or cookie may crumble while trying to cut it. TIP: If it does, wrap the baked dough and freeze overnight. The next day, a serrated knife will produce thin slices. This technique is especially useful when the biscotti containing whole nuts. Return the cookies to the pan. It isn't necessary to leave space between them. Some recipes call for standing the cut cookies on their bottom while others call for laying the cookie on its side and turning them half way through the second baking. Laying the cookies down on the pan with out parchment paper or the slicone baking liner will result in a cookie with a crispier sides, while standing them up will simply dry the cookie. Simple flip them half way through the baking time. Bake the biscotti for about 15 or 20 minutes or until they are lightly toasted; don’t overdo it because if too brown, they become rock hard when cooled. Cool the biscotti in the pan or on a rack. 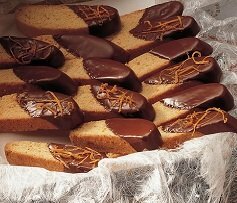 After making biscotti and when cooled, it can be glazed or drizzled with chocolate or other coatings that harden upon cooling. I recommend doing this on a cool baking sheet lined with waxed paper. HOW TO MAKE BISCOTTI AMAZING! Using a small icing knife, spread melted chocolate on one side of each cookie or dip cookie by holding onto its edges and pressing it down into a shallow pan of melted chocolate. Another option is to simply dip one end of each biscotti in melted chocolate - or, 'double dip': dip one end, cool, then make a second "shallow" dip - one end dark, one end white. Place dipped cookies on waxed paper and let it set for 1 hour until the dipping has hardened. To drizzled melted chocolate, place in a small plastic bag. Snip off the end with a small opening and squiggle chocolate over the cookie. Again, let chocolate or drizzle set for about an hour or so to harden. So much for How to Make Biscotti, where would you like to go now? Maybe you would like to check out the first Biscotti Cook Book I bought?